This chapter surveys evidence documenting positive linkages among social capital, prosocial behaviour, and subjective well-being. Whether in the workplace, at home, in the community, or among nations, better and deeper social connections, and especially higher levels of trust are linked to higher subjective well-being, even beyond the effects flowing through higher incomes and better health. Prosocial behaviour is also shown to be a robust predictor of well-being in both correlational and experimental contexts. These two lines of research are connected, as prosocial acts are most likely to increase well-being when they are delivered in ways that improve social capital, and reflect intentional generosity free of either compulsion or personal gain. We infer that these deep links between prosocial acts and well-being have an evolutionary benefit in maintaining the quality of social capital and thereby delivering cooperative human responses in times of crisis. Humans are extremely social creatures, spending much of their lives in the company of others. Indeed, social connections are one of the greatest sources of human well-being (Diener & Seligman, 2002; Lyubomirsky, Sheldon & Schkade, 2005) and, as such, this chapter surveys a range of studies showing positive linkages running from social connections, trust, and prosocial behaviour to higher subjective well-being. Although the magnitude of these effects can, at times, be difficult to establish because happier individuals are more likely to make friends, marry, and help others, this type of positive feedback loop is desirable for human welfare because it amplifies the well-being consequences of positive interventions. The reported results are primarily based on research in which we have been involved, but also set within a broader range of related studies. That humans should gain happiness from social and prosocial behaviour has been doubted by some who think that evolutionary fitness requires a sharper sense of self-interest than is implied by the evidence we survey. To resolve these doubts requires an evolutionary theory that provides greater evolutionary fitness for individuals, groups and societies that adopt and prefer prosocial behaviour. Humans are generally more social and co-operative than other mammals and their own ancestors. Such exceptional levels of social and prosocial tendencies have been linked to rapid growth of the pre-frontal cortex, the size of which has been matched to the capacity and willingness to adopt social and prosocial behaviour (Shultz & Dunbar, 2007). The ‘social brain hypothesis’ (Adolphs, 2009; Dunbar, 1998) suggests that across mammalian species, and especially among anthropoid species, pre-frontal cortex size is linked both to social group size and pair-bonding, both of which are argued or presumed to require the evaluative powers conferred by the larger neo-cortex. One evolutionary puzzle is that the neo-cortex (the ‘slow brain’; Kahneman, 2011) requires more energy than the more instinctive ‘fast brain’. Thus planning for the long term, with the required intelligent attention to the interests of others, uses more energy, placing survival at risk when times are tough. It is precisely at this point where we see an evolutionary role for social connections and prosocial actions. Social and prosocial activities provide psychological benefits, evidenced by positive emotions and higher life evaluations, beyond those directly attributed to the material rewards they enable. These additional psychological rewards help to sustain their energy costs, and hence favour the survival of societies that can combine high trust and benevolence even in the face of scarce resources and prevalent risks. Social connections can come in many forms, of course, but we focus primarily on social capital, which is defined by the OECD as “social networks, together with shared norms, values and understandings that facilitate cooperation within and among groups” (OECD, 2001, p.41). In the review that follows we summarize the existing evidence for social capital and prosocial behaviour as sources of well-being. We divide our review of the evidence as follows. First, we provide examples of the well-being benefits of social capital at work and at home, followed by discussion of results at the community, regional, and national levels. Second, we turn to the specific areas of health, the provision of public services, and the special role of trust. Finally, we conclude with a brief review of the burgeoning literature, based on both survey and experimental evidence, of the emotional benefits of prosocial behaviour. At work. Many people spend a large portion of their waking hours at work (Schor, 2008), suggesting that social connections in the workplace may be an important predictor of well-being. And they are. Canadian data has shown that to work where trust in management is one point higher on a ten-point scale has an effect on life satisfaction equal to that from a one-third increase in household income (Helliwell & Huang, 2011). Workplace social capital seems to be more important for women than men; women attach more value to trust in management and less to income than do male employees (Fortin, 2008; Helliwell & Huang, 2009). These differences combine to make the income-equivalent value of workplace trust in Canada twice as high for women as for men. The Gallup-Healthways Daily Poll in the United States shows that happiness reports differ by day of week, while evaluative questions about life as a whole do not. For most workers, weekends and holidays are significantly happier than weekdays. However, for workers who think of their immediate superior as a partner rather than a boss, and who report a high level of workplace trust, the weekend effects are very small, falling to zero for those who manage to achieve the same number of social hours on weekdays and weekends (Helliwell & Wang, 2014; 2015). The impact of social connections in the workplace may even help explain large age-related differences in life satisfaction. While life evaluations typically follow a U-shaped curve, peaking in one’s 20s and 60s and dropping in between, employees who regard their superior as a partner show no such dip in middle age in the Gallup Healthways Daily Poll. Figure 1 shows that for workers of all ages the quality of social capital on the job, as measured simply by how one’s immediate supervisor is perceived, has a large and highly significant relation to life satisfaction. For workers under 30, the effect is about 0.2 points on the 10-point scale, rising to 0.4 points for older workers. Note that for workers in high social capital workplaces, with partner-like supervisors, the middle-age drop in life evaluations is absent, with average ladder scores being the same for those aged between 45 and 54 as they are for workers under the age of 30. Figure 1. Average life satisfaction reported by individuals seeing their immediate supervisor as a boss, as a partner, and combined for ages <30, 45-54, and >65. Error bars depict 95% confidence intervals. At home. Relationships with family and friends are among the most powerful correlates of happiness all over the world. Answering “yes” to the question ‘If you were in trouble, do you have relatives or friends you can count on to help you whenever you need them, or not?’ is the single most important variable explaining differences in life satisfaction among individuals from more than 100 countries (Helliwell, Huang & Harris, 2009). To have that basic amount of social capital in the form of family and friends has, for a sample of 68,000 observations from the first three waves of the Gallup World Poll, the same value as a five-fold increase in household income (Helliwell et al, 2009).1 That is an average across the globe. When the same relationship was fitted for each country separately, having someone to count on was strongly significant in every global region, and almost every country (Helliwell et al., 2009). Similar findings emerge on more detailed measures of social capital assessing the size of and reliance upon one’s social networks. Indeed, individuals with larger and more widely used networks provide more positive life evaluations. Interestingly, however, the beneficial impact of large social networks may be limited to in-person friendships. Few surveys ask respondents parallel questions about the sizes of their networks of real and on-line friends, but one survey that has done so found that life satisfaction increases with the size of the network of face-to-face friends, but not with the existence and size of their networks of on-line friends, even in a large sample of on-line respondents (Helliwell & Huang, 2013). The relationship between marital status and subjective well-being has been widely studied. Cross-sectional correlations between marriage and life satisfaction in western nations are almost uniformly positive. To some extent these correlations are likely due to selection effects, because individuals in good circumstances, or with genetic makeup favouring happiness, may also be more likely to find and attract marriage partners (De Neve, Diener, Tay, & Xuereb, 2013; Stutzer & Frey, 2006). Studies using individual fixed effects in longitudinal datasets have been used to avoid this risk, and have sometimes shown happiness after marriage to revert to baseline levels within a few years (Clark & Georgellis, 2013, Lucas, 2007; Lucas, Clark, Georgellis, & Diener, 2003). But subsequent research has shown that, when due account is taken of a happiness U-shape that is deeper for the unmarried than the married (Anusic, Yap & Lucas, 2014a; 2014b; Yap, Anusic, & Lucas, 2012), marriage can protect against the midlife blues. It is also important to compare happiness within marriage to that of a period sufficiently far in advance of the marriage to remove the pre-marital happiness boost (Zimmerman & Easterlin, 2006) from the baseline. These adjustments fully restore the positive well-being effects of marriage, at least for those industrial countries with longitudinal surveys suitable for such analysis. The positive impact of marriage on well-being also depends on the comparison group, since alternatives are quite diverse, including those who are separated, divorced, widowed, single, and or living as a cohabitating couple. The last category is substantial and growing in many western countries, and non-existent in some other cultures. Where it is prevalent, non-married but cohabitating couples rate their well-being only slightly below that of married individuals, suggesting that the happiness benefits of marriage may be due to its provision of social capital more than to its legal structure. Looking across world regions, the value placed on marriage as an institution differs considerably, and so do its correlations with life evaluations. When the data from the Gallup World Poll (GWP) are divided into the 10 global regions used in the World Happiness Report series, separate estimation using individual-level cross-sections for each global region shows significant positive effects of marriage (relative to all other alternatives) in most regions, with notable exceptions: the effects are significantly negative in Latin America and Sub-Saharan Africa, while there are no significant correlations in South and South-East Asia (Grover & Helliwell, 2014). This diverse relationship between marriage and life satisfaction deviates from what is found for the effects of having family or friends to count on in times of trouble, which are strongly positive in all global regions. We hypothesize that cross-cultural differences in the role of marriage as a social institution are at least partly responsible for the diversity of results. If so, then we would expect to find that the well-being effects of marriage are greater in circumstances where marriage contributes to the quality of an individual’s social capital. This possibility is supported by results from a UK survey where respondents were asked to locate their best friend from a number of categories, including “spouse” as an option. The results show that although marriage and friends are both important sources of subjective well-being, the effects of marriage on life evaluations are twice as large for those who also regard their spouse as their best friend (Grover & Helliwell, 2014). The interpersonal relationships that form the basis of an individual’s social connections exist within the larger social context of neighbourhoods, cities, regions and nations. Here, we review how the quality of social connections at the community level affect subjective well-being. This is sometimes done by comparing average well-being for communities and nations, both across communities and over time, and sometimes by two-level modelling that attempts to separate the individual-level and contextual effects that are lumped together when the analysis is done using aggregated data. Comparison effects - “keeping up with the Joneses”- are generally believed to generate negative spillovers which undermine the well-being effects of income (Easterlin, 1974, 1995; Kingdon & Knight, 2007; Luttmer, 2005; Stevenson & Wolfers, 2008). By contrast, the inherently collective nature of social capital can induce positive spillovers, thereby increasing the benefits to local and national communities (Helliwell & Putnam, 2004). Indeed, the effects of social trust on life satisfaction at the national level have sometimes been found to be more pronounced in wealthier countries (Bjørnskov, 2003; Ram, 2010). Nonetheless, positive aggregate effects of various forms of social capital have been found throughout the international income distribution (Delhey & Dragolov, 2016), as well as within countries over time (Bjørnskov, 2008; Helliwell, Huang, & Wang, 2014; 2017). The role of social capital in explaining aggregate well-being at the national level is also substantial and extends well beyond its effects on health and economic outcomes. In a study of 158 countries sampled by the Gallup World Poll, Helliwell, Huang, and Wang (2015) found that measures of social support and generosity collectively explain 37% of the variation in national average life evaluations after controlling for GDP per capita, healthy life expectancy, and perceptions of freedom and corruption. Using data from the GWP, European Social Survey (ESS), and World Values Survey (WVS) to estimate wealth-equivalent values of social capital, Hamilton, Helliwell, and Woolcock (2016) estimate that social capital, as measured by trust, comprises approximately 20% of total national wealth. Across regions, estimates range from as low as 12% for Latin American countries, to as high as 28%, for OECD countries. In the important case of social trust and other self-report assessments of social capital, the validity of these international results requires that measured social capital reflect the quality of the underlying social fabric, rather than cultural biases in reporting. Providing some direct evidence for the former, Knack (2001) finds that average answers to the standard trust question across 14 European and 12 US cities in the WVS were highly correlated with the actual probability of a stranger returning a wallet in the region in question. Lending further support to this view, social trust among first-generation immigrants tends to reflect the levels of natives in the host country more closely than stayers in the source country (Dinesen, 2012; Helliwell, Wang, & Xu, 2016; see Dinesen & Sønderskov, 2017, for a recent review), suggesting that levels of trust respond to the local context. The importance of the social context may also explain why new immigrants to Canada report means and distributions of life satisfaction similar to those of Canadian-born respondents (Helliwell, Bonikowska, & Shiplett, 2016). The smaller differences that remained could come from cultural ‘footprint’ effects, or from differences in the social capital available to immigrants. In support of the latter view, others have found that gaps between the life satisfaction of immigrants and natives in developed countries can be explained by lower social support (De Vroome & Hooghe, 2014), by natives’ perceptions of immigrants (Hendriks & Bartram, 2016), and by immigrants’ own perceptions of discrimination (Safi, 2010). While international differences in social capital clearly play a large role in well-being, social capital also accrues and influences well-being through more local channels. Investigating sub-national variation in well-being can help to illuminate these channels while holding the national context fixed. Using the large samples of life satisfaction available in the Canadian Community Health Survey and General Social Survey, Shiplett, Helliwell, and Barrington-Leigh (2017) estimated levels of life satisfaction across more than 1,200 Canadian communities. In the happiest dozen communities (the 99th percentile in the sample of 1,215 communities) average life satisfaction is above 8.5, compared to less than 7.5 in the dozen least happy communities, a difference of 1.0 points on the 10-point scale. Comparing the happiest and least-happy communities in Figure 2, salient differences are apparent in residents’ reported sense of belonging to the local community, a direct measure of the level of local social connectedness, as well as inequality in life satisfaction (the within-community dispersion of life satisfaction, measured by the standard deviation of the distribution of individual life satisfaction responses), and residential tenure2, both of which provide plausible support for social capital. Figure 2. 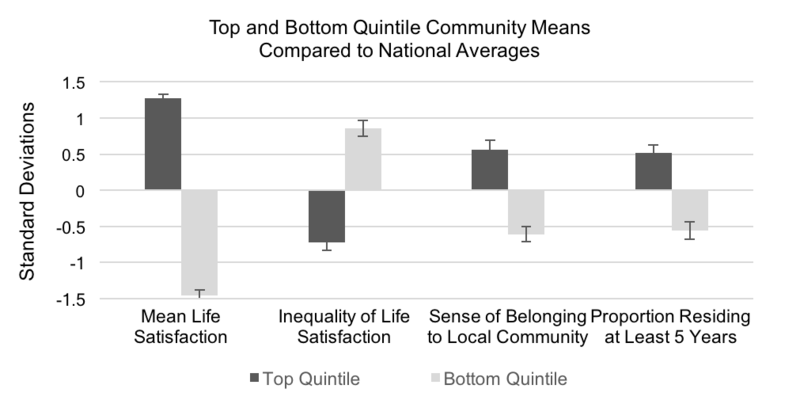 Life satisfaction is higher in communities where more people feel a sense of belonging. Multi-level models, in which measures of social capital are entered at both the individual and regional levels, provide an opportunity to separate individual and contextual effects of social capital. Thus, it is possible, for example, to separate the benefits of trusting others from those of living in a trusting environment. Using this approach, Bjørnskov (2008) finds strong effects of social trust, formal sociability, and informal sociability at the individual level, as well as contextual effects for social trust of a similar magnitude to the individual effects in regressions of residuals at the state-level in cross-section and in a region-level panel in the United States. Aslam and Corrado (2012) find similar regional benefits of general and institutional trust for European regions, and Han, Kim, and Lee (2013) find local contextual effects for organizational membership and social support at the local level in Seoul, South Korea. In the latter two cases, the contextual effects were actually larger than the already substantial individual effects. Having controlled for the potentially confounding effects of optimism through the individual responses, these significant contextual effects also provide stronger support for a causal role of social capital, especially through social trust. When measuring contextual effects in a multi-level framework, results may be sensitive to the geographic scale at which contextual variables are measured (Flowerdew, Geddes, & Green, 2001). If, for example, the contextual effects of social connectedness operate primarily through the social context in local neighbourhoods, a regression including individual and state-level measures of social connectedness may show effects for both variables to the extent that they serve as two imperfect measures of the same underlying, but omitted, neighbourhood characteristic, the first potentially imprecise but correctly scaled, the second incorrectly scaled but more precisely measured. This type of scale effect may partially explain why Bjørnskov (2008) and Aslam and Corrado (2012) do not find significant contextual effects for formal or informal sociability measured at coarser geographic scales, while Han, Kim, and Lee (2013) do find contextual effects for formal sociability in the form of organizational memberships measured at a much finer level of geographic detail. Communities with high social capital, particularly social trust, have also been documented to recover more quickly from natural disasters, such as the Tokyo earthquake of 1923 (Aldrich, 2012) and the 2004 tsunami in southern India (Aldrich, 2011). Coping with natural disasters, which requires cooperation, has been shown to be associated with subsequent increases in social trust (Toya & Skidmore, 2014), at least when it is not initially too low (Dussaillant & Guzmán, 2014). For instance, Yamamura and colleagues (2015) also show that following the Great East Japan Earthquake of 2011, the effect of trust on happiness approximately quadrupled in areas that were damaged by the earthquake. This large change can be accounted for both by the benefits of support during the disaster, but also by increases in trust, generosity, and the value placed on social connections in the wake of the disaster (Uchida, Takahashi, & Kawahara, 2014; Yamamura, Tsutsui, Yamane, C., Yamane, S., & Powdthavee, 2015). The epidemiological literature mainly uses social capital at the individual and community levels to explain the incidence of ill-health (Berkman & Glass, 2000; Berkman & Syme, 1979; Evans, Barer, & Marmor, 1994; Kawachi & Berkman, 2000; Kawachi, Kennedy, Lochner, & Prothrow-Stith, 1997; Marmot, 2005; Marmot, Ryff, Bumpass, Shipley, & Marks, 1997). For an example at the individual level, experimental research demonstrates that individuals with robust social connections are less likely to be affected by an experimentally delivered virus (Cohen, 2004; Cohen et al., 1997, 1998). A different line of research emphasizes how building positive social identities helps people achieve better health status, or speedier recovery times (Haslam et al., 2008; Haslam, Cruwys, Haslam, Dingle, & Chang, 2016). Yet another branch shows how the quality of the social context shapes the effectiveness of different health treatment strategies, ranging from the operating room to elder care. These latter studies are worth special attention, partly because they have not previously been seen through the lens of social capital, and partly because they provide a good link to the next section, where parallel evidence is considered for other aspects of public service delivery. The operating room and elder care are two areas where growing demands and complexity are leading to increasing pressures on budgets, hospital capacity, and the supply of trained professionals. Gawande (2014) has shown that these stresses are linked, and that giving more attention to the well-being of those receiving care would not only benefit patients, but would increase the well-being of providers as well. To this end, the surgical checklist developed by Gawande and others (Gawande, 2010; Haynes et al., 2009) for the World Health Organization has been widely adopted and credited with making significant improvements in patient outcomes. The role of social capital becomes clear only when researchers analyze how the guidelines are used, and where and why they are most effective. This emerging research has shown that typical application of the checklist procedures may not be enough to significantly improve outcomes (Urbach, Govindarajan, Saskin, Wilton, & Baxter, 2014). What may be most important are improvements in team training (Neily et al., 2010), team involvement (Rydenfält, Johansson, Odenrick, Åkerman, & Larsson, 2013; Walker, Reshamwalla & Wilson, 2012) and teamwork and communication in the operating room (Russ et al., 2013). An important element in building teamwork and improving communications is the timeout, where all members of the team drop their masks, introduce themselves, and discuss the case, thereby achieving the closer connections and flatter structures shown earlier to add to the happiness of team members and the quality of their work. Gawande (2014) has also argued for the need to rethink elder care by paying more attention to the quality of life of the elderly, their caregivers, and those playing both roles. Gerontologists have spelled out the need for a revolution in elder care (Theurer et al., 2015) with a well-being focus. There is increasing evidence that here, as in the operating room, providing people with social capital and prosocial opportunities is a key ingredient to improving well-being. For example, experiments in an elder care facility in Exeter, in the United Kingdom, showed that enabling residents to take even a small collaborative role in designing their own future social spaces produced improvements in health and well-being greater than those from facilities designed for them by professionals (Knight, Haslam, & Haslam, 2010). Tellingly, these improvements were accompanied by more positive feelings about fellow residents and staff, as well as more prosocial behavior. As such, providing elders with an opportunity to build social capital through interaction in meaningful and helpful ways can yield important subjective well-being benefits. In this brief section we look beyond the overall quantity and quality of public services to consider the ways in which the services are designed and delivered. Indeed, if the social context matters in a first-order way for well-being, then we would expect both the sociality and prosociality of the design and delivery of public services to have important consequences for well-being outcomes. Much of the literature analyzing the quality of government, including trust in public services has focused on the integrity and efficiency of the public services (Charron & Rothstein, 2016; Kaufman, Kraay, & Mastruzzi, 2009; see Holmberg & Rothstein, 2011 for health outcomes), and on the effects of those characteristics on the subjective well-being of the general population. A principal conclusion from this literature is that well-being depends more on the quality of the services provided than on the funds devoted to their provision. Whether the political process itself is democratic appears not to increase subjective well-being unless or until the efficiency and integrity of service provision achieves certain levels (Helliwell & Huang, 2008; Ott, 2010; see Helliwell, Huang, Grover, & Wang, 2014 for review). We have already seen how flatter workplace structures (where supervisors are seen as partners rather than bosses) are happier places to work. We shall also show later that people are more inclined to generous acts, and happier to do them, where the beneficiaries are known and local. There is some parallel evidence for the design and delivery of public services. For example, people have been found to have higher life satisfaction in those Swiss cantons that rely more heavily on referenda, giving the citizens more direct and immediate participation in government decisions (Frey, Benz, & Stutzer, 2004). It can also be argued that the success of the Singapore prison reforms of 1998 was due in large measure to the efforts made to involve all parties directly in the planning and delivery of services, thereby creating trust and new social norms, permitting not just reductions in recidivism, but also better lives for inmates, employees, families and the community at large (Helliwell, 2011). And a collaborative experimental effort to use workplace training to deliver essential skills (Gyarmati et al., 2014) showed significant gains, especially in higher trust environments, thereby showing the synergy between social capital and the delivery of more effective public services. Two more examples may help to show how social capital can be created almost anywhere, in ways that improve the well-being of all parties. At least two music schools have partnered with elder-care facilities to provide free accommodation for a small number of music school students, who then live, practice, socialize and perform in the facility, thereby improving lives for all parties (The National, 2016, Farooqui, 2017). To show that these experiments in co-living are not successful just because of the magic of music, co-housing of women soccer stars in an elder care facility was found to deliver better lives for the athletes and their elderly housemates (Gutnick, 2013). What is needed to broaden the scope and prevalence of such successes? First, it requires inspired commitment to see the opportunities and over-ride the administrative and supposedly risk-avoiding hurdles that often stand in the way of mixing ages, skills, and interests in untraditional ways. Second, the music school examples show the importance of success stories being told, as the Canadian example (Farooqui, 2017) was inspired by a CBC story (The National, 2016) on the earlier experiment in Cleveland. Although the co-living examples involve social experiments in the field of elder-care, and thus could have been recounted in the health care section of the chapter, we include them here to emphasize that opportunities for the creation of happiness-inducing social capital exist in all institutions, communities and workplaces, whether public or private, large or small. Trust is sometimes treated as a part of social capital and sometimes as independent but co-determined, with causal arrows running from high trust to other forms of social capital, and from other forms of social capital to high trust. We do not think there is any need to prefer one or the other of these two definitional approaches, as long as the various types and dimensions of trust are distinguished, and their links to well-being established. Analysts are slaves to what is measured, and that applies especially to trust, where measurement is often absent or rudimentary. The most long-standing measure of trust, often referred to as ‘social trust’, is based on answers to the question “Do you think that other people can generally be trusted, or (alternatively) that you cannot be too careful in dealing with people?’ Social trust, measured using this question, has been found to be highly correlated with subjective well-being in previous studies (Helliwell, Huang, & Wang, 2014; Helliwell & Wang, 2011). It has become and remains the canonical survey question on trust partly because of its long-standing use (since Almond & Verba, 1963), and partly because, as we show below, it is a reasonable but under-stated proxy for a wider range of more specific measures of trust. Some large surveys have begun to include more detailed measures of the different dimensions of trust. For example, the ESS (Huppert el al., 2009) asks a number of trust questions (unfortunately not yet including the neighbourhood and the workplace) on a 0 to 10 response scale that provides a more information-rich set of responses than are available from the binary response scale frequently used for the social trust question. Using the ESS data, Helliwell, Huang and Wang (2017) recently found significant individual-level partial correlations with life evaluations for five separate trust measures, even when they were all simultaneously included. These included social trust, trust in police, trust in the legal system, trust in parliament and trust in politicians. The two largest effects were for social trust and trust in police, with each providing an effect larger than the sum of effects provided by the other three variables. Social trust, if entered on its own, and hence standing in for the other forms of trust, attracts a significantly higher coefficient than when entered in parallel, reflecting the ability of the general measure to capture some of the missing measures. But it is not a complete substitute for the other measures, since social trust used on its own delivers an estimated well-being effect that is only half as large as the combined effect of an improvement in all five measures of trust, as shown in Figure 3. Figure 3. Social trust captures only some of the well-being effects of trust. Estimated life satisfaction effects from an increase of 1 point on ESS 10-point trust scale. Error bars depict 95% confidence intervals. Earlier sections have already shown how workplace and neighbourhood trust levels provide additional subjective well-being above and beyond that due to their impacts on incomes5 and health. We also showed how high trust communities demonstrate more resilience in the face of natural and other community-level shocks. In addition, individuals living in what they feel to be a high-trust environment are more resilient to shocks that are specific to them (Helliwell, Huang, & Wang, 2017). By way of example, ESS data allow this to be shown for three quite different unfortunate circumstances faced by individuals: unemployment, ill-health, and feeling subject to discrimination. Figure 4 depicts three pairs of bars, each showing the loss in SWB from one of three adversities- discrimination, ill-health and employment, with two bars for each condition, one with and one without high social trust. Being subject to any one of these circumstances is associated with significantly lower life evaluations. But the effects are smaller, by about 14% for unemployment, and up to 38% for discrimination, for those who rate the trustworthiness of others at 7 or above on the 0 to 10 scale used for the ESS trust question. Figure 4. Resilience is higher for individuals reporting higher levels of social trust. Much of the preceding evidence is correlational, or makes use of natural experiments. There is also an extensive literature (Ostrom, 2000) documenting the prevalence (but not universality) of prosocial and trust-building behavior in the context of prisoner’s dilemma games and in the development of co-operative solutions to common property management problems. Although the outcomes are typically not measured directly in terms of subjective well-being, they include improved trust, better social norms, more effective solutions for water-management, and other important collective action problems. Two features of this large literature are especially relevant in the context of this chapter. First, face-to-face personal communications have been repeatedly found (Balliet, 2010) to increase the probability of co-operative behavior in prisoner’s dilemma games and resource management problems. Second, rules for cooperative management developed internally by co-operating groups have been shown to be more efficient than are externally developed and imposed rules, despite the greater enforceability of the latter (Bardhan, 2000; Frohlich & Oppenheimer, 1996; Cardenas, Stanlund & Willis, 2000). Both findings show how important it is for people to participate in the design and improvement of the social norms and institutions governing their lives. Both of these strands of experimental evidence show that social trust and co-operation can be created and employed in ways that improve well-being. There are many policy areas where these lessons can be applied – but they require more attention to the social context of decision-making, and the need to build upon the innate human capacities for social and pro-social behaviour. If humans are extremely social beings and meaningful connections with others are one of the most reliable predictors of happiness (Diener & Seligman, 2002; Lyubomirsky et al., 2005), how do people manage to create, maintain and strengthen social connections with other people? One way is by assisting others through prosocial action. Indeed, engaging in acts of kindness and generosity can improve connections with others and thereby promote the well-being of all parties, including the giver. Consistent with this logic, a large and growing body of research demonstrates that giving leads to greater well-being for the giver. For instance, data from nearly 30,000 people across 29 states in the United States demonstrates that people who volunteer more frequently are both healthier and happier than those who do not volunteer, even after controlling for well-known predictors of well-being, such as age, gender, relationship status, education, and income (Borgonovi, 2008). This association between volunteerism and happiness extends beyond the United States and has been documented in several countries around the globe. Data from over 30,000 people in 12 countries indicates that individuals who have volunteered within the last month reported higher life satisfaction and lower depression than those who did not volunteer (Haski-Leventhal, 2009). Beyond volunteerism, providing informal care or support to one’s spouse, family, and friends yields benefits for the care provider. Indeed, in a sample of older married adults, Brown and colleagues (2003) found that mortality rates were lower for individuals who provided instrumental support to family, friends, and neighbours as well as emotional support to their spouse (also Schwartz & Sendor, 1999; Thomas, 2009). Interestingly, receiving support did not predict morality rates when support provision was controlled for along with other demographic variables. Finally, using one’s financial resources to help others, called prosocial spending, is associated with higher well-being as well. For instance, individuals who donated money to charity reported higher levels of life satisfaction, in most countries around the globe, than those who did not (Aknin, Barrington-Leigh et al., 2013). Critically, the impact of prosociality on well-being is causal. For instance, Lyubomirsky and colleagues (2005) found that participants randomly assigned to engage in five acts of kindness in a single day weekly for six weeks reported higher subjective well-being relative to a control group who did not engage in prosocial behavior. More recently, Nelson, Layous, Cole, and Lyubomirsky (2016) report that participants randomly assigned to one of two prosocial conditions, completing kind acts for other people or for the world, reported greater positive emotions and decreased negative emotions over a 6-week span than individuals randomly assigned to do a nice thing for themselves or keep track of their daily activities. Experimental evidence also demonstrates the benefits of support provision. Individuals randomly assigned to hold their romantic partner’s hand while the partner received electric shocks displayed greater activation in pleasure centers of the brain, such as the ventrial striatum and septal area, than individuals not able to support their partners (Inagaki & Eisenberg, 2012). Finally, engaging in prosocial spending yields hedonic rewards (Dunn, Aknin & Norton, 2008; 2014). For instance, when students were randomly assigned to spend a windfall of either $5 or $20 on themselves or someone else by the end of the day, those who spent the money on someone else were happier, regardless of the dollar amount (Dunn et al., 2008). Similar experimental findings have been demonstrated in rich and poor countries (Aknin, Barrington-Leigh et al., 2013), and in small-scale traditional villages (Aknin, Broesch, Hamlin & van de Vondervoort, 2015). Thus, even though the prevalence of pro-social behavior has been shown to depend on genes (Kitayama et al., 2014), culture (Bell, Richerson & McElreath, 2009), environmentally shaped differences in farming crops (Talhelm et al., 2014) and interactions among them, the emotional rewards appear robust, emerging in a variety of different cultural contexts. Even toddlers under the age of two smile more when giving away edible treats than when receiving treats themselves (Aknin, Hamlin & Dunn, 2012). When is prosociality most likely to promote well-being? Four key factors have been identified. First, prosocial behavior yields the greatest emotional rewards when it facilitates social connection. For instance, individuals randomly assigned to engage in prosocial spending were happiest at the end of the day when their actions allowed for time spent with the recipient (Aknin, Dunn, Sandstrom & Norton, 2013). If giving with social connection is more emotionally rewarding, this may help explain why people prefer to support local causes and charities to which they have a personal connection (Small & Simonsohn, 2008). Moreover, social connection may also explain why giving items that are closely tied to oneself, such as a previously owned item or blood, leads to greater commitment and subsequent generosity than giving gifts with minimized personal connection (Koo & Fischbach, 2016). Prosocial action is also more likely to promote subjective well-being when generosity is motivated by altruistic, as opposed to selfish, motives. Supporting this claim, correlational research reveals that volunteering is associated with lower mortality risk in older adults, but only when volunteering is motivated by other-oriented (as opposed to self-oriented) motives (Konrath, Fuhrel-Forbis, Lou, & Brown, 2012). Similarly, other-oriented motives reported by a sample of volunteer healthcare workers predicted life satisfaction, but self-oriented motives did not (Veerasamy, Sambasivan & Kumar, 2015). Experimental evidence points to similar conclusions. For instance, participants randomly assigned to recall a time they engaged in helping behavior motivated by concern for others reported higher positive emotions than participants assigned to recall a time they engaged in helping behavior to benefit themselves (Wiwad & Aknin, under review). This may be why introducing opportunity for self-benefit undermines the emotional rewards of giving. Indeed, Wang and Tong (2015) found that people report greater happiness after making private (as opposed to public) donations, potentially because public donations are more likely to be motivated by self-focused concerns. Two final factors that make the benefits of giving more likely are volition and impact. When people feel that their kind acts are compelled by others, giving does not translate into well-being benefits (Weinstein & Ryan, 2010). This may be at least part of the reason why required volunteer work, such as community service learning programs, have no detectable benefits on subjective well-being in experimental tests (Whillans et al., 2016); making prosocial actions mandatory undermines an actor’s volition, which is important for experiencing the emotional rewards of giving. Finally, feeling as if one has made a positive impact on others also enhances the well-being benefits of giving. When donors know how their dollars will be used to help others, larger donations lead to greater well-being. Importantly, however, when information about impact is absent, larger donations do not predict greater well-being (Aknin, Dunn, Whillans, Grant, & Norton, 2013). This offers another, complementary explanation for why people prefer to give to local charities – because they are more likely to see the impact of their gift and experience emotional rewards as a result (Touré -Tillery & Fischbach, 2017). The warm glow of giving not only offers an immediate reward for prosociality, but may prompt subsequent generous action. Indeed, consistent with classic research demonstrating that positive affect predicts helping behavior (Isen, 1970; Isen & Levin, 1972), more recent work has shown that positive affect experienced after recalling a previous prosocial spending purchase predicts future generous spending (Aknin, Dunn & Norton, 2011). To the extent that emotions serve to signal and promote adaptive behavior, this positive feedback loop makes sense. Giving allows us to create and maintain meaningful relationships with others. Since relationships are so essential to our survival and well-being, positive emotions serve to make this prosocial action more likely in the future. This chapter shows how the quality of the social fabric can affect subjective well-being. Whether in the workplace, in the home, in the community, or among nations, tighter and more reliable social connections are linked to happiness, whether measured by positive affect or higher life evaluations. Governments were shown to enable higher life evaluations when they develop and deliver policies in ways that build social capital in the process. Our review of prosocial acts showed them to be most effective at increasing happiness, and therefore most likely to be repeated, in situations where social capital, as measured by trust and shared social norms, is high. This synergy linking social capital, prosocial behaviour and subjective well-being both underlies and supports our presumption that such a combination is likely to be successful, even on an evolutionary time scale, wherever it is found. 1In Table 4 of Helliwell et al. (2009), the coefficient on the log of household income is 0.54, compared to 0.91 on the availability of family and friends. Hence the income multiple to offset the absence of helpful family and friends is 5.4 (=exp(0.91/0.54)). 2While residential tenure has also been found to have a positive effect on subjective well-being by Shields, Price, and Wooden (2009), at least for males, the aggregate effects may differ according to scale and context. Talhelm and Oishi (2014), for example, find that rates of residential mobility are positively associated with happiness in states with more extroverted populations, but negatively for states with more introverted populations, suggesting that the balance between the benefits of variety and stability may depend on the social context. 3See also Gudmundsdottir (2013) for an account of the well-being effects of the financial crisis in Iceland. 4Based on GWP data, Spain Italy and Greece ranked among the largest decreases in life evaluations from 2005-2007 to 2012-2014, while Iceland and Ireland rank at the top of the distribution in terms of the proportion of individuals who reported having someone to count on in times of adversity. 5Evidence linking social trust with the levels and rates of growth of GDP is reported by, among others, Algan & Cahuc (2010), Bjørnskov (2012), Helliwell & Putnam (1995), Knack & Keefer (1997) and Zak & Knack (2001). Adolphs, R. (2009). The social brain: Neural basis of social knowledge. Annual Review of Psychology, 60, 693-716. Aknin, L. B., Barrington-Leigh, C. P., Dunn, E. W., Helliwell, J. F., Burns, J., Biswas-Diener, R., ... & Norton, M. I. (2013). Prosocial spending and well-being: Cross-cultural evidence for a psychological universal. Journal of Personality and Social Psychology, 104(4), 635-652. Aknin, L. B., Broesch, T., Hamlin, K. J., Van de Vondervoort, J. W. (2015). Prosocial behaviour leads to happiness in a small-scale rural society. Journal of Experimental Psychology: General, 144, 788-795. Aknin, L. B., Dunn, E. W., & Norton, M. I. (2011). Happiness runs in a circular motion: Evidence for a positive feedback loop between prosocial spending and happiness. Journal of Happiness Studies, 13(2), 347-355. Aknin, L. B., Dunn, E. W., Sandstrom, G. M., & Norton, M. I. (2013). Does social connection turn good deeds into good feelings? The value of putting the “social” in prosocial spending. International Journal of Happiness and Development, 1(2), 155-171. Aknin, L. B., Dunn, E. W., Whillans, A. V., Grant, A. M., & Norton, M. I. (2013). Making a difference matters: Impact unlocks the emotional benefits of prosocial spending. Journal of Economic Behavior and Organization, 88, 90-95. Aldrich, D. P. (2011). The externalities of strong social capital: Post-tsunami recovery in Southeast India. Journal of Civil Society, 7(1), 81–99. Aldrich, D. P. (2012). Social, not physical, infrastructure: The critical role of civil society after the 1923 Tokyo earthquake. Disasters, 36(3), 398–419. Algan, Y., & Cahuc, P. (2010). Inherited trust and growth. The American Economic Review, 100(5), 2060-2092. Almond, G., & Verba, S. (1963). The civic culture: Political attitudes and democracy in five countries. Princeton: Princeton University Press. Anusic, I., Yap, S. & Lucas, R. (2014a). Testing set-point theory in a Swiss national sample: Reaction and adaptation to major life events. Social Indicators Research, 119(3), 1-24. Anusic, I., Yap, S. & Lucas, R. (2014b). Does personality moderate reaction and adaptation to major life events? Analysis of life satisfaction and affect in an Australian national sample. Journal of Research in Personality, 51, 69-77. Aslam, A., & Corrado, L. (2012). The geography of well-being. Journal of Economic Geography, 12(3), 627–649. Balliet, D. (2010). Communication and cooperation in social dilemmas: A meta-analytic review. Journal of Conflict Resolution, 54(1), 39-57. Bardhan, P. (2000). Irrigation and cooperation: An empirical analysis of 48 irrigation communities in South India. Economic Development and Cultural Change, 48(4), 847-865. Bell, A. V., Richerson, P. J., & McElreath, R. (2009). Culture rather than genes provides greater scope for the evolution of large-scale human prosociality. Proceedings of the National Academy of Sciences, 106(42), 17671-17674. Berkman, L. F., & Glass, T. (2000). Social integration, social networks, social support, and health. Social Epidemiology, 1, 137-173. Berkman, L. F., & Syme, S. L. (1979). Social networks, host resistance, and mortality: A nine-year follow-up study of Alameda County residents. American Journal of Epidemiology, 109(2), 186-204. Bjørnskov, C. (2003). The happy few: Cross-country evidence on social capital and life satisfaction. Kyklos, 56(1), 3–16. Bjørnskov, C. (2008). Social capital and happiness in the United States. Applied Research in Quality of Life, 3(1), 43–62. Bjørnskov, C. (2012). How does social trust affect economic growth? Southern Economic Journal, 78(4), 1346-1368. Borgonovi, F. (2008). Doing well by doing good: The relationship between formal volunteering and self-reported health and happiness. Social Science & Medicine, 66(11), 2321-2334. Brown, S. L., Nesse, R. M., Vinokur, A. D., & Smith, D. M. (2003). Providing social support may be more beneficial than receiving it: Results from a prospective study of mortality. Psychological Science, 14(4), 320-327. Cardenas, J. C., Stranlund, J., & Willis, C. (2000). Local environmental control and institutional crowding-out. World Development, 28(10), 1719-1733. Charron, N., & Rothstein, B. (2016). Does education lead to higher generalized trust? The importance of quality of government. International Journal of Educational Development, 50, 59-73. Clark, A. E., & Georgellis, Y. (2013). Back to baseline in Britain: Adaptation in the British Household Panel Survey. Economica, 80(319), 496-512. Cohen, S., Doyle, W. J., Skoner, D. P., Rabin, B. S., & Gwaltney, J. M. (1997). Social ties and susceptibility to the common cold. Journal of the American Medical Association, 277(24), 1940-1944. Cohen, S., Frank, E., Doyle, W. J., Skoner, D. P., Rabin, B. S., & Gwaltney Jr, J. M. (1998). Types of stressors that increase susceptibility to the common cold in healthy adults. Health Psychology, 17(3), 214. De Neve, J. E., Diener, E., Tay, L., & Xuereb, C. (2013). The objective benefits of subjective well-being. In J. F. Helliwell, R. Layard, & J. Sachs (Eds. ), World Happiness Report 2013 (pp. 54-79). New York: UN Sustainable Development Solutions Network. De Vroome, T., & Hooghe, M. (2014). Life satisfaction among ethnic minorities in the Netherlands: Immigration experience or adverse living conditions? Journal of Happiness Studies, 15(6), 1389-1406. Delhey, J., & Dragolov, G. (2016). Happier together: Social cohesion and subjective well-being in Europe. International Journal of Psychology, 51(3), 163-176. Dinesen, P. T. (2012). Does generalized (dis)trust travel? Examining the impact of cultural heritage and destination-country environment on trust of immigrants. Political Psychology, 33(4), 495-511. Dinesen, P. T., & Sønderskov, K. M. (2017). Cultural persistence or experiential adaptation? A review of studies using immigrants to examine the roots of trust. In E. M. Uslander (Ed. ), The Oxford handbook of social and political trust. Oxford University Press. Dunn, E. W., Aknin, L. B., & Norton, M. I. (2014). Prosocial spending and happiness: Using money to benefit others pays off. Current Directions in Psychological Science, 23, 41-47. Dussaillant, F., & Guzmán, E. (2014). Trust via disasters: The case of Chile’s 2010 earthquake. Disasters, 38(4), 808-832. Easterlin, R. A. (1974). Does economic growth improve the human lot? Some empirical evidence. In P. A. David & M. W. Reder (Ed. ), Nations and households in economic growth: Essays in honour of Moses Abramovitz (pp. 89-125), New York: Academic Press, Inc.
Easterlin, R. A. (1995). Will raising the incomes of all increase the happiness of all? Journal of Economic Behavior & Organization, 27, 35-47. Flowerdew, R., Geddes, A., & Green, M. (2001). Behaviour of regession models under random aggregation. In N. J. Tate & P. M. Atkinson (Eds. ), Modeling scale in geographical information science (1st ed., pp. 89–104). John Wiley & Sons, LTD.
Fortin, N. M. (2008). The gender wage gap among young adults in the United States: The importance of money versus people. Journal of Human Resources, 43(4), 884-918. Frey, B. S., Benz, M., & Stutzer, A. (2004). Introducing procedural utility: Not only what, but also how matters. Journal of Institutional and Theoretical Economics, 160(3), 377-401. Frohlich, N., & Oppenheimer, J. A. (1996). Experiencing impartiality to invoke fairness in the n-PD: Some experimental results. Public Choice, 86(1), 117-135. Gawande, A. (2010). Checklist manifesto, the (HB). Penguin Books India. Gawande, A. (2014). Being mortal: Medicine and what matters in the end. Macmillan. Grover, S., & Helliwell, J. F. (2014). How’s life at home? New evidence on marriage and the set point for happiness. NBER Working Paper No. 20794. Gudmundsdottir, D. G. (2013). The impact of economic crisis on happiness. Social Indicators Research, 110(3), 1083–1101. Gyarmati, D., Leckie, N., Dowie, M., Palameta, B., Hui, T. S. W., Dunn, E., & Hébert, S. (2014). UPSKILL: A credible test of workplace literacy and essential skills training. Social Research and Demonstration Corporation Working Paper No. 143. Hamilton, K., Helliwell, J. F., & Woolcock, M. (2016). Social capital, trust and well-being in the evaluation of wealth. NBER Working Paper No. 22556. Han, S., Kim, H., & Lee, H.-S. (2013). A multilevel analysis of the compositional and contextual association of social capital and subjective well-being in Seoul, South Korea. Social Indicators Research, 111(1), 185–202. Haski-Leventhal, D. (2009). Elderly volunteering and well-being: A cross-European comparison based on SHARE data. Voluntas: International Journal of Voluntary and Nonprofit Organizations, 20, 388-404. Haslam, C., Cruwys, T., Haslam, S. A., Dingle, G., & Chang, M. X. L. (2016). Groups 4 Health: Evidence that a social-identity intervention that builds and strengthens social group membership improves mental health. Journal of Affective Disorders, 194, 188-195. Haslam, C., Holme, A., Haslam, S. A., Iyer, A., Jetten, J., & Williams, W. H. (2008). Maintaining group memberships: Social identity continuity predicts well-being after stroke. Neuropsychological Rehabilitation, 18(5-6), 671-691. Haynes, A. B., Weiser, T. G., Berry, W. R., Lipsitz, S. R., Breizat, A. H. S., Dellinger, E. P., ... & Merry, A. F. (2009). A surgical safety checklist to reduce morbidity and mortality in a global population. New England Journal of Medicine, 360(5), 491-499. Helliwell, J. F. (2011). Institutions as enablers of wellbeing: The Singapore prison case study. International Journal of Wellbeing, 1(2), 255-265. Helliwell, J. F., Bonikowska, A., & Shiplett, H. (2016). Migration as a test of the happiness set point hypothesis: Evidence from immigration to Canada. NBER Working Paper No. 22601. Helliwell, J. F., & Huang, H. (2008). How’s your government? International evidence linking good government and well-being. British Journal of Political Science, 38(4), 595-619. Helliwell, J. F., & Huang, H. (2009). Well-being in the workplace: What roles for unions and gender? Re-Creating Canada: Essays in Honour of Paul Weiler. Helliwell, J. F., & Huang, H. (2011). Well-being and trust in the workplace. Journal of Happiness Studies, 12(5), 747-767. Helliwell, J. F., & Huang, H. (2013). Comparing the happiness effects of real and on-line friends. PloS one, 8(9), e72754. Helliwell, J. F., & Huang, H. (2014). New measures of the costs of unemployment: Evidence from the subjective well‐being of 3.3 million Americans. Economic Inquiry, 52(4), 1485-1502. Helliwell, J. F., Huang, H., & Harris, A. (2009). International differences in the determinants of life satisfaction. In B. Dutta, T. Ray, & E. Somanathan (Ed. ), New and enduring themes in development economics (pp. 3-40). World Scientific Publishing. Helliwell, J. F., Huang, H., & Wang, S. (2014). Social capital and well-being in times of crisis. Journal of Happiness Studies, 15(1), 145–162. Helliwell, J. F., Huang, H., & Wang, S. (2015). The geography of world happiness. In J. F. Helliwell, R. Layard, & J. Sachs (Eds. ), World Happiness Report 2015 (pp. 12–41). New York: Sustainable Development Solutions Network. Helliwell, J. F., Huang, H., & Wang, S. (2017). New evidence on trust and well-being. In E. M. Uslander (Ed. ), The Oxford handbook of social and political trust. Oxford University Press. Helliwell, J. F., & Putnam, R. D. (1995). Economic growth and social capital in Italy. Eastern Economic Journal, 21(3), 295-307. Helliwell, J. F., & Putnam, R. D. (2004). The social context of well-being. Philosophical Transactions-Royal Society of London Series B Biological Sciences, 359(1449), 1435-1446. Helliwell, J. F., & Wang, S. (2011). Trust and well-being. International Journal of Wellbeing, 1(1), 42-78. Helliwell, J. F., & Wang, S. (2014). Weekends and subjective well-being. Social Indicators Research, 116(2), 389-407. Helliwell, J. F., & Wang, S. (2015). How was your weekend? How the social context underlies weekend effects in happiness and other emotions for US workers. PLOS ONE, 10(12), e0145123. Helliwell, J. F., Wang, S., & Xu, J. (2016). How durable are social norms? Immigrant trust and generosity in 132 countries. Social Indicators Research, 128(1), 201–219. Hendriks, M., & Bartram, D. (2016). Macro-conditions and immigrants’ happiness: Is moving to a wealthy country all that matters? Social Science Research, 56, 90–107. Holmberg, S., & Rothstein, B. (2011). Dying of corruption. Health Economics, Policy and Law, 6(04), 529-547. Huppert, F. A., Marks, N., Clark, A., Siegrist, J., Stutzer, A., Vittersø, J., & Wahrendorf, M. (2009). Measuring well-being across Europe: Description of the ESS well-being module and preliminary findings. Social Indicators Research, 91(3), 301-315. Inagaki, T. K., & Eisenberger, N. I. (2012). Neural correlates of giving support to a loved one. Psychosomatic Medicine, 74(1), 3-7. Isen, A. M. (1970). Success, failure, attention, and reaction to others: The warm glow of success. Journal of Personality and Social Psychology, 15(4), 294-301. Isen, A. M., & Levin, P. F. (1972). Effect of feeling good on helping: Cookies and kindness. Journal of Personality and Social Psychology, 21(3), 384-388. Kawachi, I., & Berkman, L. F. (2000). Social cohesion, social capital, and health. In L. F. Berkman, & I. Kawachi (Ed. ), Social epidemiology (pp. 174-190). New York: Oxford University Press. Kingdon, G. G., & Knight, J. (2007). Community, comparisons and subjective well-being in a divided society. Journal of Economic Behavior & Organization, 64(1), 69–90. Kitayama, S., King, A., Yoon, C., Tompson, S., Huff, S., & Liberzon, I. (2014). The dopamine D4 receptor gene (DRD4) moderates cultural difference in independent versus interdependent social orientation. Psychological Science, 25(6), 1169-1177. Knack, S. (2001). Trust, associational life and economic performance. In J. F. Helliwell (Ed. ), The contribution of human and social capital to sustained economic growth and well-being. Quebec: Human Resources Development. Knight, C., Haslam, S. A., & Haslam, C. (2010). In home or at home? How collective decision making in a new care facility enhances social interaction and wellbeing amongst older adults. Ageing and Society, 30(08), 1393-1418. Koo, M., & Fishbach, A. (2016). Giving the self: Increasing commitment and generosity through giving something that represents one’s essence. Social Psychological and Personality Science, 7(4), 339-348. Lucas, R. E. (2007). Adaptation and the set-point model of subjective well-being: Does happiness change after major life events? Current Directions in Psychological Science, 16(2), 75-79. Luttmer, E. F. P. (2005). Neighbors as negatives: Relative earnings and well-being. The Quarterly Journal of Economics, 120(3), 963-1002. Marmot, M., Ryff, C. D., Bumpass, L. L., Shipley, M., & Marks, N. F. (1997). Social inequalities in health: Next questions and converging evidence. Social Science & Medicine, 44(6), 901-910. Neily, J., Mills, P. D., Young-Xu, Y., Carney, B. T., West, P., Berger, D. H., ... & Bagian, J. P. (2010). Association between implementation of a medical team training program and surgical mortality. Journal of the American Medical Association, 304(15), 1693-1700. OECD (2001). The well-being of nations: The role of human and social capital. Paris: Organisation for Economic Cooperation and Development. Ostrom, E. (2000). Collective action and the evolution of social norms. The Journal of Economic Perspectives, 14(3), 137-158. Ram, R. (2010). Social capital and happiness: Additional cross-country evidence. Journal of Happiness Studies, 11(4), 409–418. Russ, S., Rout, S., Sevdalis, N., Moorthy, K., Darzi, A., & Vincent, C. (2013). Do safety checklists improve teamwork and communication in the operating room? A systematic review. Annals of Surgery, 258(6), 856-871. Rydenfält, C., Johansson, G., Odenrick, P., Åkerman, K., & Larsson, P. A. (2013). Compliance with the WHO Surgical Safety Checklist: Deviations and possible improvements. International Journal for Quality in Health Care, 25(2), 182-187. Safi, M. (2010). Immigrants’ life satisfaction in Europe: Between assimilation and discrimination. European Sociological Review, 26(2), 159–176. Schor, J. (2008). The overworked American: The unexpected decline of leisure. Basic books. Schwartz, C. E., & Sendor, R. M. (1999). Helping others helps oneself: Response shift effects in peer support. Social Science & Medicine, 48(11), 1563-1575. Shields, M. A., Price, S. W., & Wooden, M. (2009). Life satisfaction and the economic and social characteristics of neighbourhoods. Journal of Population Economics, 22(2), 421–443. Shiplett, H., Helliwell, J. F., & Barrington-Leigh, C. P. (2017). How can communities be spatially defined to better reveal community-level happiness? Manuscript in preparation. Shultz, S., & Dunbar, R. I.M. (2007). The evolution of the social brain: Anthropoid primates contrast with other vertebrates. Proceedings of the Royal Society of London B: Biological Sciences, 274(1624), 2429-2436. Stevenson, B., & Wolfers, J. (2008). Economic growth and subjective well-being: Reassessing the Easterlin Paradox. Brookings Papers on Economic Activity, 2008, 1–87. Stutzer, A., & Frey, B. S. (2006). Does marriage make people happy, or do happy people get married? The Journal of Socio-Economics, 35(2), 326-347. Talhelm, T., & Oishi, S. (2014). Residential mobility affects self-concept, group support, and happiness of individuals and communities. In P. J. Rentfrow (Ed. ), Geographical psychology: Exploring the interaction of environment and behavior (pp. 219–239). American Psychological Association. Theurer, K., Mortenson, W. B., Stone, R., Suto, M., Timonen, V., & Rozanova, J. (2015). The need for a social revolution in residential care. Journal of Aging Studies, 35, 201-210. Thomas, P. A. (2009). Is it better to give or to receive? Social support and the well-being of older adults. The Journals of Gerontology Series B: Psychological Sciences and Social Sciences, 65B(3):351-357. Touré-Tillery, M., & Fishbach, A. (2017). Too far to help: The effect of perceived distance on the expected impact and likelihood of charitable action. Journal of Personality and Social Psychology, 112(6), 860-876. Toya, H., & Skidmore, M. (2014). Do natural disasters enhance societal trust? Kyklos, 67(2), 255–279. Uchida, Y., Takahashi, Y., & Kawahara, K. (2014). Changes in hedonic and eudaimonic well-being after a severe nationwide disaster: The case of the Great East Japan Earthquake. Journal of Happiness Studies, 15(1), 207–221. Urbach, D. R., Govindarajan, A., Saskin, R., Wilton, A. S., & Baxter, N. N. (2014). Introduction of surgical safety checklists in Ontario, Canada. New England Journal of Medicine, 370(11), 1029-1038. Veerasamy, C., Sambasivan, M., & Kumar, N. (2015). Life satisfaction among healthcare volunteers in Malaysia: Role of personality factors, volunteering motives, and spiritual capital. VOLUNTAS: International Journal of Voluntary and Nonprofit Organizations, 26(2), 531-552. Walker, I. A., Reshamwalla, S., & Wilson, I. H. (2012). Surgical safety checklists: Do they improve outcomes? British Journal of Anaesthesia, aes175. Wang, X., & Tong, L. (2015). Hide the light or let it shine? Examining the factors influencing the effect of publicizing donations on donors’ happiness. International Journal of Research in Marketing, 32(4), 418-424. Whillans, A.V., Seider, S.C., Chen, L., Dwyer, R.J., Novick, S., Gramigna, K.J., Mitchell, B.A., Savalei, V., Dickerson, S.S., & Dunn, E.W. (2016). Does volunteering improve well-being? Comprehensive Results in Social Psychology, 1(1-3), 35-50. Wiwad, D. & Aknin, L. B. (under review). Self-focused motivations undermine the emotional rewards of recalled prosocial behavior. Manuscript submitted for publication. Yamamura, E., Tsutsui, Y., Yamane, C., Yamane, S., & Powdthavee, N. (2015). Trust and happiness: Comparative study before and after the Great East Japan Earthquake. Social Indicators Research, 123(3), 919–935. Zak, P. J., & Knack, S. (2001). Trust and growth. The Economic Journal, 111(470), 295-321. Zimmermann, A. & Easterlin (2006). Happily ever after? Cohabitation, marriage, divorce, and happiness in Germany. Population and Development Review, 32(3), 511-528.